The vine's growth cycle dictates the vine grower's work throughout the year. At the Cave de Tain, the rigorous maintenance of our vineyard is a priority because it affects the quality of our wines. Only a perfect state of health and the discipline of our team enable optimal ripeness to be reached. Two vineyard technicians work on a daily basis with our growers, with a view to improving practices and obtaining the best possible grapes each year. 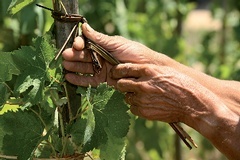 In our Hermitage plots, vines are attached using knotted straw. Admire the complexity of these knots, which require years of practice!